Located in Atlanta, the Georgia Aquarium is the “Museum of the Day” for January 29, 2014. The Georgia Aquarium is the world’s largest aquarium with more than 10 million gallons of water and more aquatic life than any other aquarium. Situated in the heart of downtown Atlanta, Georgia Aquarium is a nonprofit organization dedicated to being a global leader in research and conservation programs that mirror the unique and amazing animals seen within the facility. Since its founding, Georgia Aquarium has been committed to inspiring current and future generations through a focus on respectful display, education and conservation of marine mammals and all aquatic species. Aquarium staff, partners and researchers are impacting the future of our aquatic world by ensuring that guests learn and care about the extraordinary animal ambassadors and in the hopes they become advocates on their behalf. 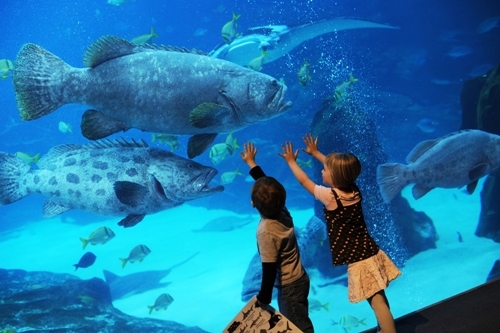 The six distinct galleries within Georgia Aquarium depict different aquatic habitats, ranging from arctic to tropical waters, featuring the largest collection of aquatic animals. The Aquarium is a $250+ million gift to the Atlanta community and the people of the state of Georgia from Bernie Marcus, co-founder of The Home Depot, and his wife Billi, through the Marcus Foundation. The Aquarium in total is a $433+ million facility. The Aquarium opened debt-free to the city of Atlanta November 23, 2005. The Aquarium is a 501(c) 3 non-profit organization, overseen by a board of directors. Considered by many to be one of the best in the world, this is definitely in the top 5 of the U.S. The Monterey Bay Aquarium has attracted more than 47 million visitors and has won awards for its exhibits, architecture, and cultural and educational impacts. We’re located on historic Cannery Row in Monterey and open daily except Christmas. Hours vary by season. 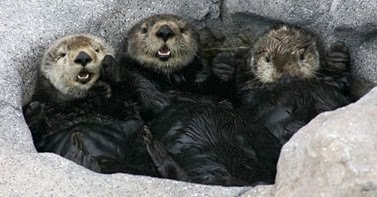 Daily schedules available at www.montereybayaquarium.org or by calling (831) 648-4888. Our mission is to inspire conservation of the oceans. This museum makes use of technology as few I’ve seen. TAKE your smart phone (dumb phones too) and use their mobile website, the native app, AND your texting feature to immerse yourself into the living collections that surround you. You won’t miss any WOW or LOL moments with their live texting features. Wireless internet is available at the Aquarium free of charge. You can browse the internet with your Wi-Fi-enabled cell phones, tablets and other devices. We offer discounted tickets to active duty and retired military personnel at the door. However, your entire group can receive the discounted rate by purchasing tickets through a military base. AAA members may also receive a discount when purchasing tickets directly from any Northern California AAA office. The Monterey Bay Aquarium is unable to sell AAA discounts at the gate. We offer our “two days for the price of one” ticketing program through participating hotels. You may also purchase discounted tickets to the Aquarium plus four more top San Francisco attractions with CityPASS. Additionally, companies sometimes provide discounted tickets to their employees. These special rates are not available through the Aquarium itself, but must be purchased directly from these institutions. We also extend a discount to groups of 12 or more when paying together with an advance reservation. And by all means, GIVE back to the museum to help support the animals.